Okay, I know it's still November but December is literally around the corner, which means my Christmas spirit is at an all time high- and what better way to kick off the silly season than with a steaming mug of hot chocolate? Perfect for a Christmas movie marathon with your friends or even on your lonesome, trust me- I wouldn't want to share this mug either! You can easily adapt this recipe so you can enjoy it all year round, just omit the spices and VOILA! Keep reading to the end of this post because MY FIRST EVER YOUTUBE VIDEO IS HERE! Never fear, I will still be posting here as usual every Wednesday and Sunday as well as uploading to YouTube on Sundays. Make sure you're subscribed so you don't miss out! Mix all ingredients together in a small saucepan on a low heat. Keep stirring until everything is mixed and heated through. Pour into a glass/ mug and decorate. Pick your favourite Christmas movie, sit back and enjoy! Tell me, on a scale of 1 to Santa, how excited are YOU for Christmas? 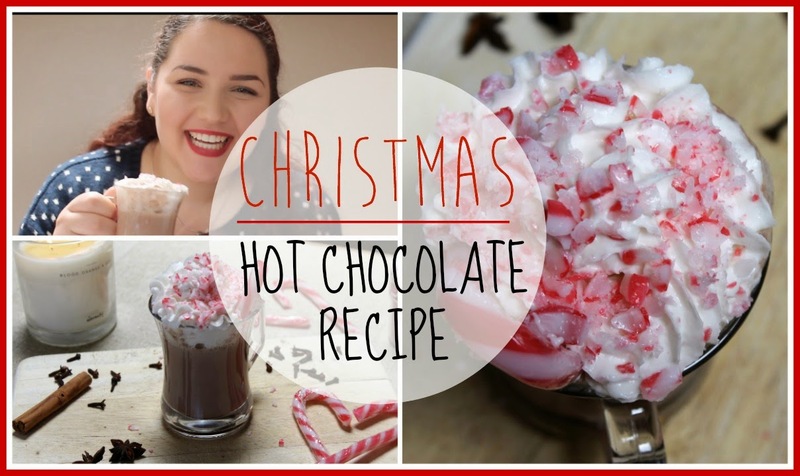 This hot chocolate looks amazing, definitely going to be trying it out! This looks too good and I love the crushed candy cane topping idea! Thanks Beth! It was a spur of the moment idea, but I think it turned out well! Thank you, hope you come back and visit for the rest of Blogmas! I know right, who doesn't love a good hot chocolate?! Yay I'm so glad! Please let me know how you get along! Thank you! Please let me know if you do! Would love to see your results!